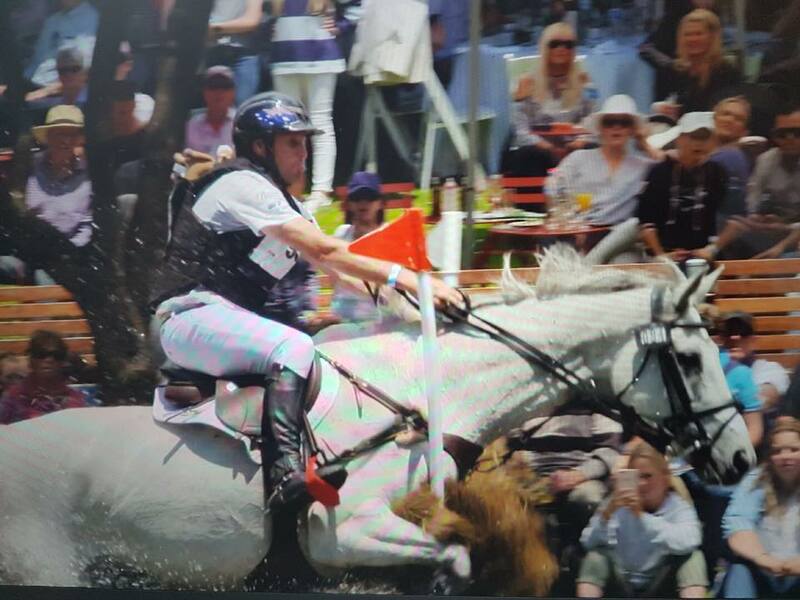 The Adelaide CCI****, held Nov. 17-19 in Australia, highlighted problems involved with interpreting a Fédération Equestre Internationale eventing rule regarding cross-country penalties. The ground jury at Adelaide dealt with four cases involving this rule, with one in particular sparking discussion and criticism online. Various videos and screenshots appeared to show eventual third-placed finisher Stuart Tinney on War Hawk glancing off the side of a narrow brush obstacle set in the water. Tinney did not re-present War Hawk and was originally assigned 50 penalties for the apparent runout at the narrow brush. The ground jury, led by Christian Landolt, later removed Tinney’s 50 penalties after photos showed the horse with the point of his shoulder between the flags at the fence. A screenshot of the incident involving Stuart Tinney and War Hawk at this year’s Adelaide CCI****. Video of Stuart Tinney’s ride to the fence in question. But debate regarding Tinney’s incident and the other three cases of the rule being applied at Adelaide called into question whether the rule gives a clear enough definition of what constitutes a runout. Virginia Thompson on Star Nouveau was also initially given 50 penalties at the same narrow as Tinney, but she also had her penalties removed when the ground jury reviewed the evidence. Megan Jones, who rode Kirby Park Impress and eventually finished in second place, picked up her 50 at fence 26B, a brush corner. After reviewing photos and video after the third horse inspection, the ground jury removed the penalties before Jones show jumped. Hazel Shannon was the only rider of the four whose 50 penalties remained on her final score aboard Willingapark Clifford. Shannon incurred the penalties at the third element of the combination at fence 5 and finished the competition in 13th. The Adelaide ground jury debated how much of the shoulder must pass through the flag. Was it 100 percent or “part thereof?” There was also discussion on whether the note section, which states: “A horse will be considered to have cleared the fence when head, neck and both shoulders of the horse pass between the extremities of the element or obstacles as flagged” is part of the rule. In addition, Landolt said he will talk to the FEI about the problems encountered. He added that he thought the only way to be 100 percent sure would be to use lasering and other technical equipment. “If it had been a world championship, it would have been a nightmare because you would have had lawyer versus lawyer,” he said. However, the U.S. Equestrian Federation announced in a press release on Nov. 22 that it approved the deletion of all references to the FEI’s 50-penalty rule for USEF eventing competitions in 2018. “In that the rule has been amended by the FEI on more than one occasion and discussions continue regarding the correct application of the rule, the USEF Eventing Sport Committee agreed that while the verbiage of the rule remains in flux with the FEI, it should not be included in the USEF Rules for Eventing,” the statement reads. Jonathan Holling, four-star eventer and the USEF’s Eventing Sport Committee vice chair, said the USEF was attempting to stay in line with the FEI’s rules when it implemented its own version this year, but the organization ultimately decided to steer back to the previous rule after about two months. “We said, ‘OK, well, we’re going to try and stay consistent with the FEI rules, like we try to do in most cases,’ ” said Holling. “Then the FEI said they were going to put it in and test it for a year, and we said, ‘OK, if it’s not permanent then we don’t really want it in,’ and in the year where that rule has been in place it’s brought up a lot more questions than initially anticipated. As the USEF rule stands now, a first runout will be assessed 20 penalties. If a horse-and-rider pair is determined to have not cleared an obstacle by going through the flags before continuing and jumping the next obstacle, that pair will be eliminated. U.S. team rider and Australian native Boyd Martin did not compete at Adelaide this year but saw the videos and photos of Tinney and War Hawk online. Martin thinks the problem has less to do with the rule and more to do with modern skinny fences. “It reminds me of Phillip Dutton and Mighty Nice at the Rio Olympics last year; it’s a tough one. These skinnies and narrows are getting so tight to get a horse through,” said Martin, referring to an incident from Rio de Janeiro where eventual individual bronze medalist Phillip Dutton barely managed to get Mighty Nice’s shoulder between the flags on cross-country. 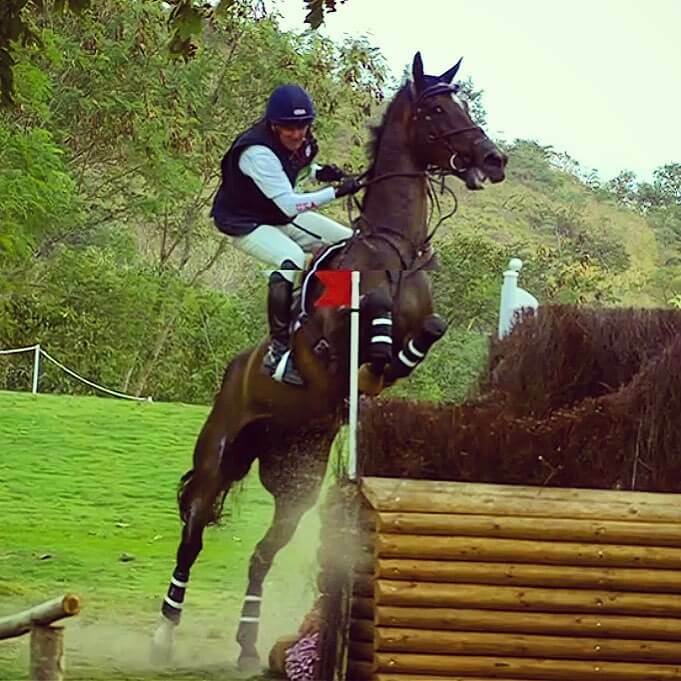 Phillip Dutton and Mighty Nice on course at the 2016 Rio Olympics. Dutton agreed with Martin’s analysis of the part course design plays in applying the rule.